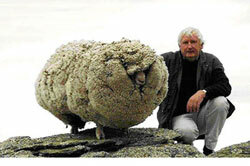 Chris the sheep became famous several years ago when he was found after hiding out in caves for six years. Of course, during this time his wool grew without anyone there to shear (shave) it. When he was finally found and shaved, his wool weighed an amazing sixty pounds. Most sheep have a fleece weighing just under ten pounds, with the exception usually reaching fifteen pounds, maximum. For six years, Chris carried six times the regular weight of his fleece. Simply because he was away from his shepherd. This reminds us of John 10 when Jesus compares Himself to a shepherd, and His followers are His sheep. Don't you think that Chris is much like a person who knows Jesus Christ but has wandered? If we avoid Christ's constant refining of our character, we're going to accumulate extra weight in this world – a weight we don't have to bear. When Chris was found, a professional sheep shearer took care of Chris's fleece in twenty-eight minutes. Chris's sixty pound fleece was finally removed. All it took was coming home to his shepherd. Christ can lift the burdens we carry, if only we stop hiding. He can shave off our "wool" – that is, our self-imposed burdens brought about by wandering apart from our Good Shepherd.